Thank you to all of those who have helped us pray during the cholera epidemic. 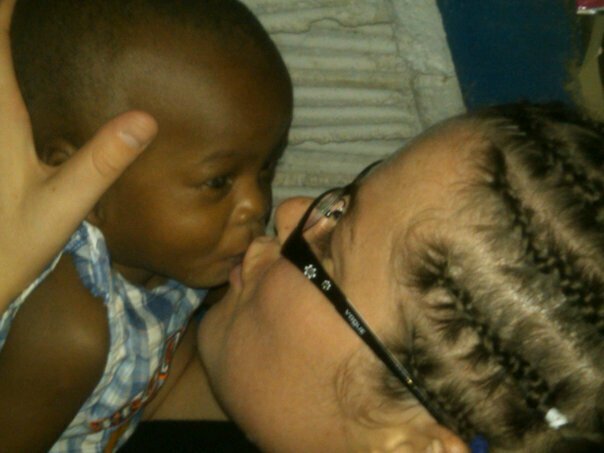 The doctor has arrived in Haiti and is on his way to the orphanage. We will continue to keep you updated. The doctor and one or two other men will arrive in Haiti tomorrow. We still need to schedule helpers for basic child care and medical or nursing staff for after they leave. We are also in need of funding to help cover the extra costs associated with isolation, caring for the children and medication etc. We also have people who are willing to go if we can help them with travel expenses. 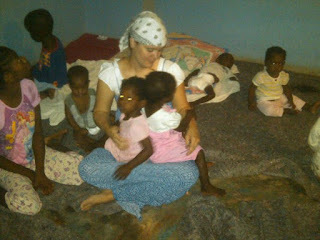 If you can help in this way, please see our website at http://www.haitichildrenshome.com/ for information on how to donate funds. We are getting a doctor!!! And some extra hands! This is in addition to the nurse who was loaned to HCH by another organization over the weekend. The nurse will be at HCH until Tuesday. We praise God as this is a huge answer to prayer. Thank you to everyone who has been helping us look for help. We will need more helpers over the next several weeks so please feel free to contact us if you would like to help. We are now up to 7 children with symptoms of cholera (adoptive parents will be contacted personally if their children become ill). 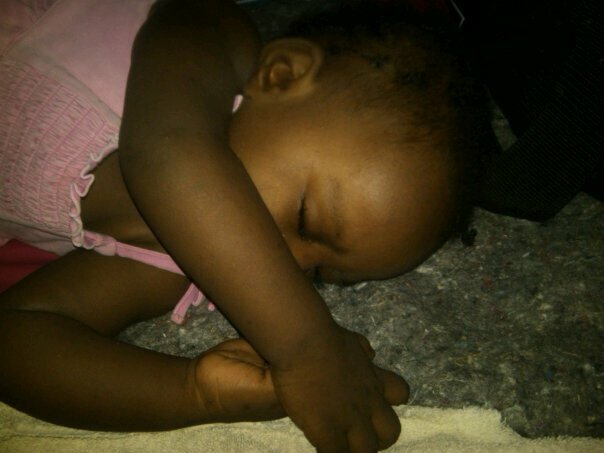 There seems to a new patient to our little 'cholera' unit every few hours; so far only one has had to be on IV fluid. We pray that God will continue to allow their symptoms to be moderate and not severe like Evan was at first. Please continue to hold Shae and Melissa up in prayer; they are very weary and exhausted. They have only had 4 hours of sleep since Friday when all of this started. They have been so busy that in addition to sleep deprivation they have also lacked in nutrition as they haven't had time to stop and eat much. 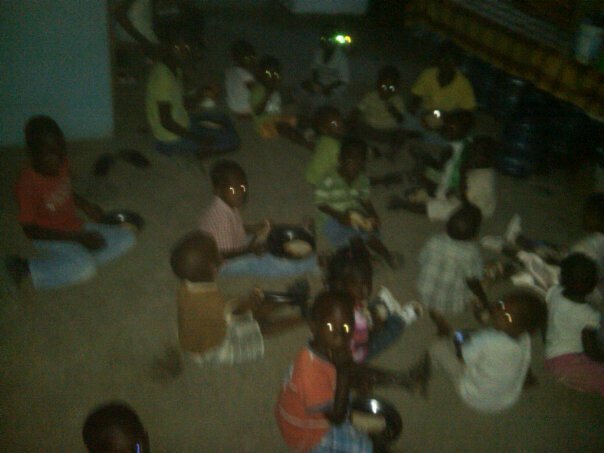 Please help us pray that God will put a hedge of protection about them. Please continue to help us pray for the people of Haiti; those in Haiti who are ill or could become ill and those living in the deplorable conditions left by the earthquake. Please also remember the Haitian people (and missionaries) living in other countries who are experiencing great anxiety and grief over their families. If you would like to help, items can be dropped off to Lori West for the team to take with them. Please contact Lori West on facebook or at sorrylori@hotmail.com for more information. 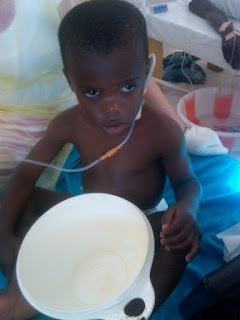 If you would like to donate funds to help with medication and other expenses related to this crisis, please see the website www.haitichildrenshome.com for more information on how to donate. Evan had to return to the hospital around 9:30 this evening, He developed vomiting again and the diarrhea continues regularly in large quantities. He does have cholera and is being treated. We do have a couple of possible leads on nurses. Please help us pray that we will get a nurse. Our little Evan at the hospital. 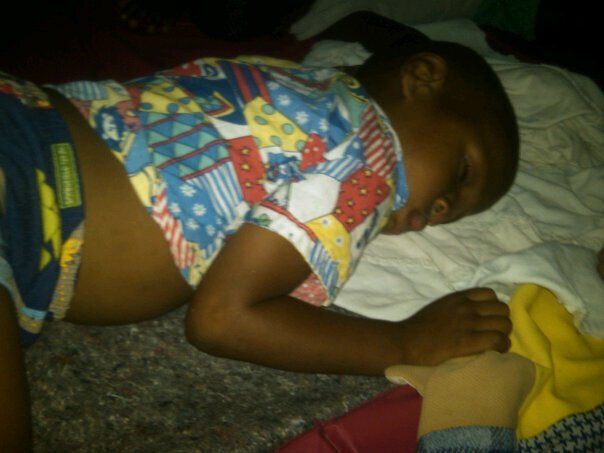 The results are not back confirming whether he has cholera or not but the symptoms are all there. Please keep our little guy in your prayers. Please pray for protection and health for Shae, Melissa and Sadrack as they take turns sitting at his bedside today and through the night. 5:15PM- The hospital has just released Evan. He is being quarantined at HCH for the next 5 days. Shae and Melissa will continue to care for him and stay with him unti he is completely well and no longer has to be quarantined. We are still in need of someone who can start IV's. Cholera is spreading rapidly once again. It has now reached Port-au-Prince and several other regions that did not have it previously. It is on the rise again in our village as well. Shae just reported that people are arriving every few minutes to be admitted to the cholera unit. We currently have Evan admitted to the hospital for IV therapy. He is being tested for cholera as he has severe diarrhea and vomiting; he was so dehydrated when he arrived at the hospital this morning that the staff had a lot difficulty getting an IV needle in him. He is stable and Shae and Melissa are with him. Levi was also taken to the hospital this morning with symptoms but the doctors said he does not have cholera so he was treated and sent home. Please keep us in your prayers and if you can start IV's and would like to help please let us know. Melissa and Shae cuddling and loving in the midst of it all. We thank God for them. As of last night all of the children and staff from HCH were evacuated to a local church. 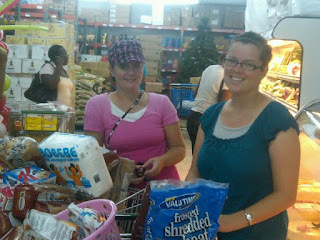 Shae and Melissa worked very hard along with the staff to get everything packed and get the children moved. Although the accomodations are a bit crowded it is reassuring to all that that the children have safer housing on higher ground and the water on the church compound is safe. Everyone involved was very exhausted by the end of the day but very relieved to have the job done.